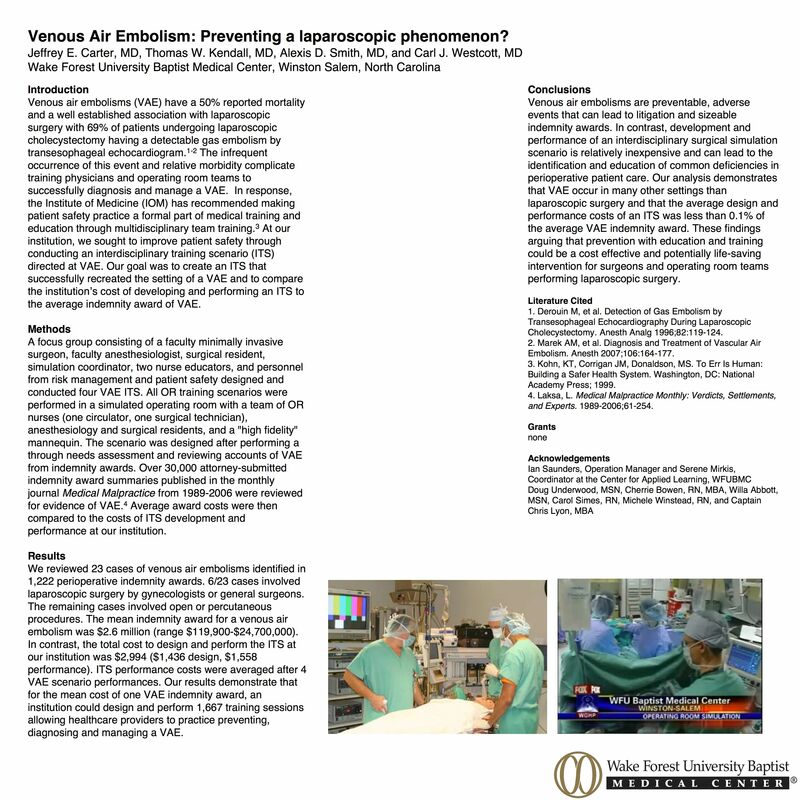 Venous Air Embolism: Preventing a Laparoscopic Phenomenon? Venous air embolism (VAE) is a rare but potentially devastating complication of laparoscopic surgery. The patient outcomes from VAE are poor with a reported 50% mortality and the event represents a significant risk of malpractice risk exposure for hospitals and physicians. The infrequent occurrence and severity of this event make it a perfect target for team based simulation training. At our institution, we sought to improve patient safety through conducting an interdisciplinary training scenario (ITS) directed at VAE. Our goal was to create an ITS that successfully recreated the setting of a VAE and to compare the institution’s cost of developing and performing an ITS to the average indemnity award of VAE. A focus group consisting of a faculty minimally invasive surgeon, faculty anesthesiologist, surgical resident, simulation coordinator, two nurse educators, and personnel from risk management and patient safety designed and conducted four VAE ITS. All OR training scenarios were performed in a simulated operating room with a team of OR nurses (one circulator, one surgical technician), anesthesiology and surgical residents, and a “high fidelity” mannequin. The scenario was designed after performing a through needs assessment and reviewing accounts of VAE from indemnity awards. Over 30,000 attorney-submitted indemnity award summaries published in the monthly journal Medical Malpractice from 1989-2006 were reviewed for evidence of VAE. Average award costs were then compared to the costs of ITS development and performance at our institution. 23 cases of venous air embolism were identified in 1,222 indemnity awards. 6/23 cases involved laparoscopic surgery by gynecologists or general surgeons. The remaining cases involved open or percutaneous procedures. The mean indemnity award for a venous air embolism was $2.6 million (range $119,900-$24,700,000). In contrast, the total cost to design and perform the ITS at our institution was $2,994 ($1,436 design, $1,558 performance). ITS performance costs were averaged after 4 VAE scenario performances. Our results demonstrate that for the mean cost of one VAE indemnity award, an institution could design and perform 1,667 training sessions allowing healthcare providers to practice preventing, diagnosing and managing a VAE. Venous air embolisms are preventable, and can lead to sizeable indemnity awards. In contrast, development and performance of an interdisciplinary surgical simulation scenario is relatively inexpensive and can lead to the avoidance of VAE as well as identification of the event and subsequent management protocols. Our analysis demonstrates that VAE occur in many other settings than laparoscopic surgery and that the average design and performance costs of an ITS was less than 0.1% of the average VAE indemnity award. These findings argue that prevention with education and training could be a cost effective and potentially life-saving intervention for surgeons and operating room teams performing laparoscopic surgery.